Ludovic Ballouard Half Time Chinese. At the first glance, it looks as though the dial is in a gibberish mess of some sort. The Half Time may not be really comprehensible at the first glance. The dial, to a pair of untrained eyes, may look like some sort of gibberish to any layman. In fact, because the numerals of this variant comes in Chinese characters, it made the watch even more obfuscated. You have got to admit that this interesting watch has attracted your attention already. Well, that was what Ludovic Ballouard wants to achieve- to make watches that are unique, poetic, and fun. The Half Time epitomizes that perfectly. Unique, poetic, and fun. Well, we thought the Half Time embodies those characteristics very well. 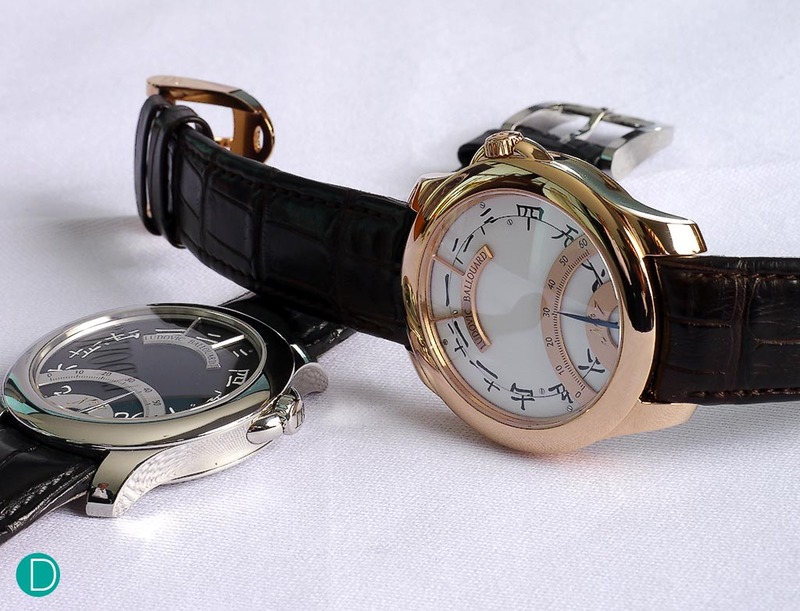 The watch consists of two complications: the retrograde minute hand and the twin-rotating hour disks. The retrograde minute hand is a great complication, but we are more interested in the twin-rotating hour disks. The idea was to dissect the hour disk into two halves: the top and bottom half. While the top half follows the time in the counterclockwise position, the numerals on the bottom half are set in the clockwise position. This made the dial messy, but that is vital for the complication to work. As shown on the picture above, the time is now 1:31. The hour is displayed at the 12 o’clock position, in which it is segregated from the other numerals via a window. When the retrograde hand hits 60, it would “jump” back to 0. Concurrently, the two hour disks would move. The top half would move to the left by one numeral, while the bottom half will move to the right by one numeral as well. The numerals will join each other in the window at the 12 o’clock position, and that is the only position where the top and bottom half of the numerals will be matched correctly. The movement of the disks are also instantaneous, which is quite a technical feat. It may be a little difficult to digest, but we believe that the watch can be much more appreciated once people understand how the mechanics of the Half Time works. It is truly something brilliant and original. With the exception of the complications, the watch actually follows a rather simple design cue. We thought this juxtaposition was excellent, as the simple dressy case design allows us to focus more on the unique complications of the watch. Well, it also emphasize this point: Dress watches do not have to be boring all the time. The Half Time is not only unique, but it is very complicated as well. 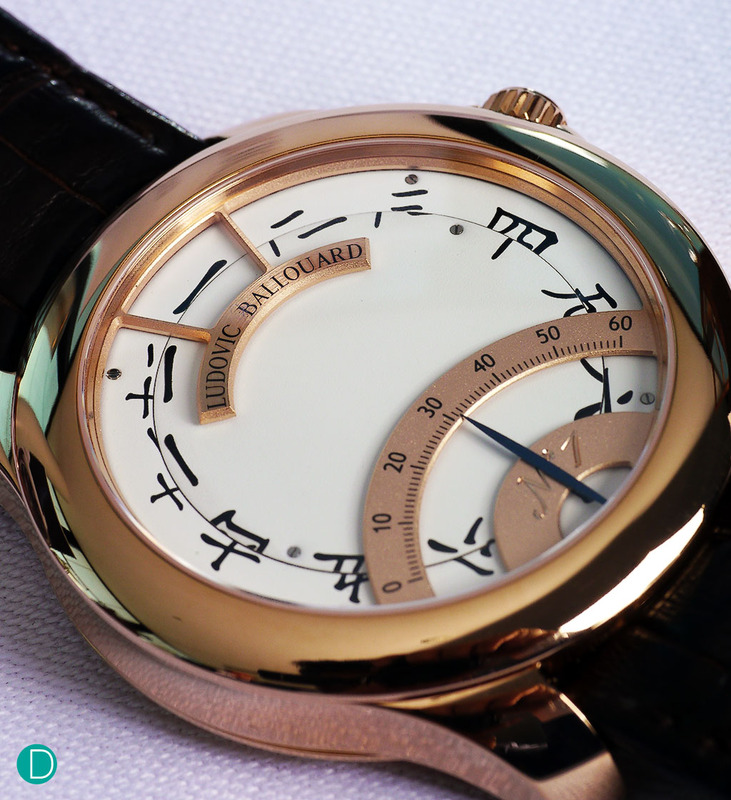 As per other Ludovic Ballouard pieces, the movements are entirely created and designed in-house. 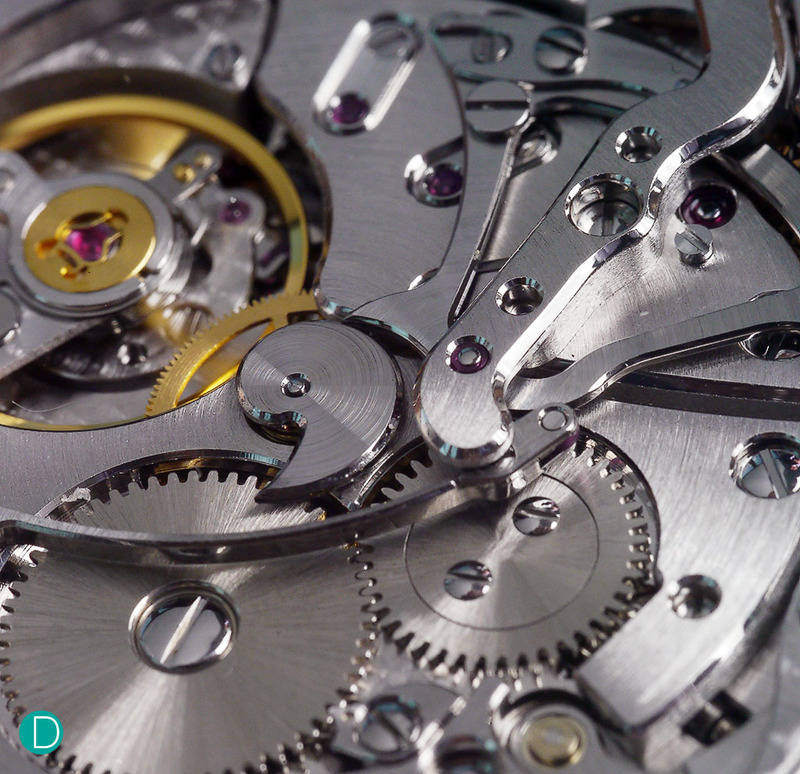 The manually-wound movement features more than 300 components and 53 jewels, and a power reserve of around 30 hours. The finishing of the movement is great as well. In fact, the movement is actually rather visually appealing. 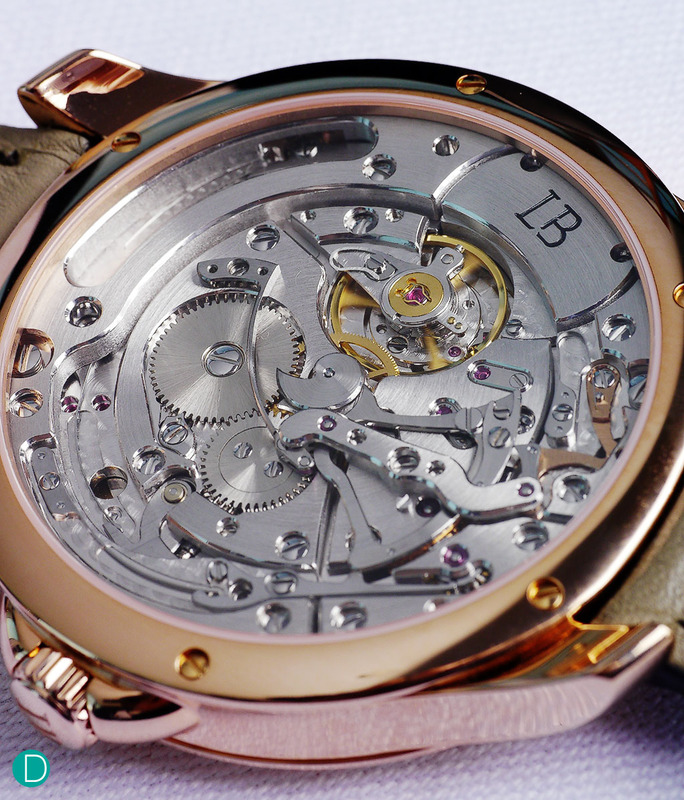 A close-up shot of the movement. The finishing is great, but the mechanics behind it is even more mind-blowing. Overall, we are impressed by the Half Time. What about you? We thought that the Ludovic Ballouard Half Time was rather impressive. 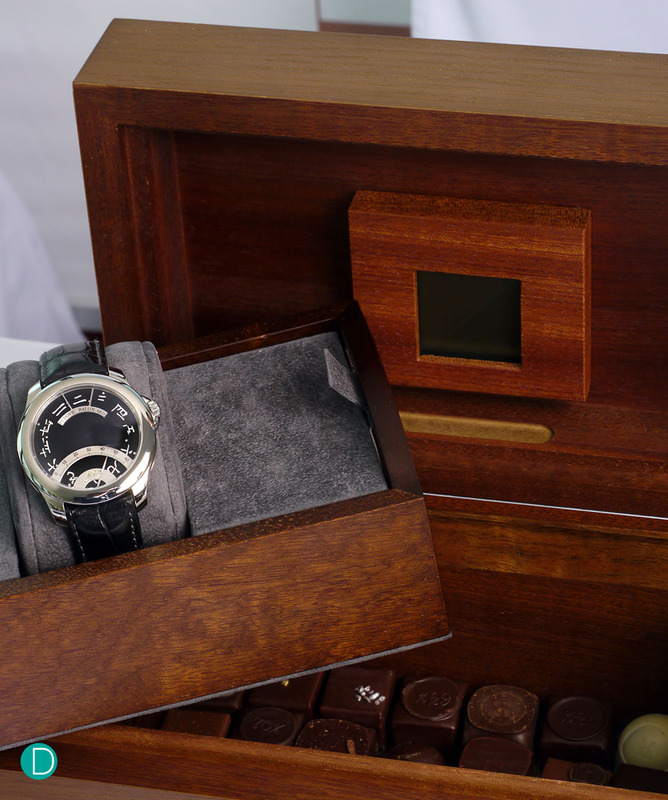 It features excellent finishing, as well as marvelous mechanisms. What we have here is a nice and conversational dress watch that balances uniqueness and subtlety very well. This version that we featured in this article here consist of Chinese numerals. Ludovic Ballouard also produces the Half Time with roman numerals. The 41mm watch is cased in either 950 Platinum or 750 Red Gold. The retail price in Switzerland, without taxes is CHF76,000 for the platinum, and CHF70,000 for red gold. Production is limited to around 50 pieces annually, which includes the Upside Down. Well, we guess this makes the Half Time even much more desirable now?  Frequency : 21,600 bph / 3 Hz.